**Heavyweight 7 x 7" boxset with art insert and download code redeemable from the label. 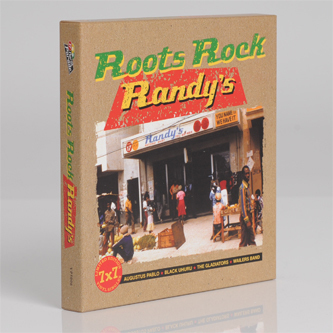 Includes 14 tracks produced by Clive Chin at Randy's for The Wailers Band, Augustus Pablo, Black Uhuru, Hortense Ellis, and more** "From its original inception in 1967, Randy's Studio rapidly turned into the primary destination for a host of Jamaica's upcoming producers and musicians. The unique combination of vision and skill shared by the studio's resident producer-engineers Clive Chin and Errol Thompson, assisted by a small group of peerless house musicians, encouraged the creation of audio masterpieces in every reggae style, including the '70s Roots and Dub Classics gathered together here on original label 45's in a set of highly desirable vintage style sleeves." Tracklisting: 7" # 1 a) Augustus Pablo & Bongo Herman - Java Passion, b) Winston Wright and The Impact All Stars - Wood Pecker, 7" # 2 a) Hortense Ellis - Woman Of The Ghetto, b) Broadway - Guns In The Ghetto, 7" # 3 a) Roots and The Wailers Band - Evil That You Do, b) The Wailers Band - Don Won Dub, 7" # 4 a) Ansel Collins and Skin Flesh & Bones - Spanish Town Road, b) Impact All Stars - S-Corner Dub, 7" # 5 a) Black Uhuru - Going To Zion, b) Augustus Pablo and The Impact All Stars - Zion Dub, 7" # 6 a) The Gladiators - The Race, b) The Gladiators - The Race Dub, 7" # 7 a) African Brothers - Hold Tight, b) Impact All Stars - Tight Dub.